Few companies can thrive for a half century unless they consistently turn out products of the highest quality. 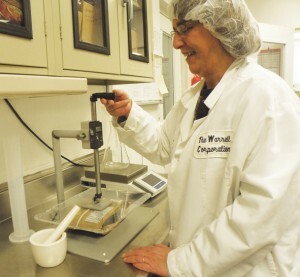 Since our inception in 1965, the Warrell Corporation has made quality a top priority in all of our candy manufacturing processes. We’ve implemented the most stringent quality-control measures to ensure we always deliver a safe, quality product to manufacturers and consumers. The Warrell Corporation is proud to be an approved supplier for many of the world’s top food companies and retailers. Our dedicated Quality Assurance Department continuously audits our operations to assure that our — and your — high standards are always met. Our quality-control process has also been certified by several third-party auditors as a means of verifying the thoroughness of our quality procedures. 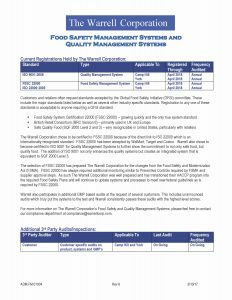 Why is it so important that Warrell Corporation be a GFSI-approved candy manufacturer, and why do we take pride in being a kosher-certified candy manufacturer? It comes down to our commitment to being the best-quality candy supplier for our partners and their customers. One of the benefits of Warrell Corporation being a certified candy manufacturer in Pennsylvania that’s been in business for more than 50 years is the trust we have built up with our partners. We want every new partner that we supply to be able to share in that trust. When candy retailers and consumers see that we are SQF3 equivalent and GFSI approved, they know they are dealing with a safe, quality candy manufacturer. That level of trust means our partners can confidently sell our products to their customers, knowing our products and ingredients are held to a higher standard. That means more success for them, which means more success for us. What Does It Mean to Be a GFSI-Approved Candy Manufacturer? The Global Food Safety Initiative is an international industry-based collaborative effort to advance and promote food safety throughout the world. It does this through information, networking, and approving and recognizing food safety schemes designed to ensure compliance through third-party audits. To achieve certification, a food manufacturer must choose a recognized scheme, adjust their manufacturing process to meet the requirements of that scheme and contact the appropriate certification body to audit its system for certification. The recognized scheme Warrell Corporation products are certified under is FSSC 22000, which is based on existing ISO standards. 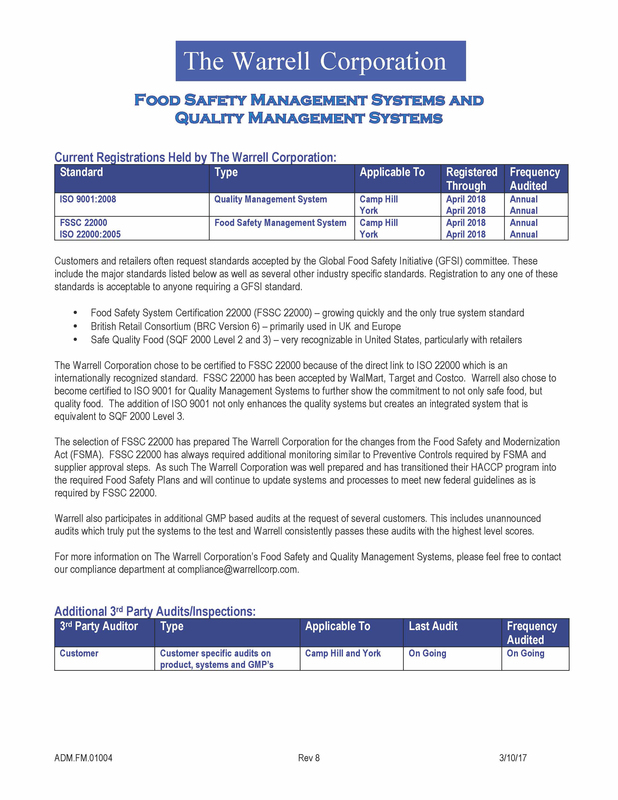 According to the Independent Foundation FSSC 22000, “it demonstrates your company has a robust Food Safety Management system in place that meets the requirements of your costumers and consumers.” In other words, when a company has FSSC 22000 certification, you can be confident they are a safe, quality candy manufacturer. What Does It Mean to Be a Kosher Certified Candy Manufacturer? 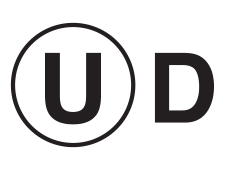 In the case of Warrell Corporation being a kosher-certified candy manufacturer means having products certified kosher by the Orthodox Union, the strictest governing body for determining whether food meets kosher dietary law requirements. What are kosher dietary laws? They are rules regarding what food can be eaten and how they can be eaten as laid out in the Bible. These are rules that Orthodox Jews are required to follow, so it’s very important for people of the Jewish faith to know candy is kosher-certified so that they can safely enjoy it. However, kosher candy is about more than obeying ancient religious doctrine. The kosher dietary laws are rooted in meaningful health concerns. While some laws, like the prohibition against eating meat and dairy together, may seem arcane, most prohibitions were due to the animal in question being perceived as unclean. You won’t find any pig or pig product in a kosher food, but you also can be sure you won’t find any insect or reptile parts mixed in. Offering kosher-certified candy is another way we can ensure our partners can supply customers with candy they know is healthy, and also prepared with care and quality workmanship.